You’d think after thirty-six episodes The Red Panda Adventures would have become formulaic – to have settled into a well-worn style. It sure doesn’t feel that way, RP shows no signs of becoming anything like a mere dry routine. The familiarities are only in the iconic lines of character dialogue that are heard in every episode – bits like: “Kit Baxter, behave yourself!” and “He’ll face justice at the hands of The Red Panda!” If there is a formula, it must be a magic one secretly possessed by Gregg Taylor and the Decoder Ring crew. There’s really no other way to explain how bloody wonderful this show really is. Voice talent abounds in the Decoder Ring troupe, there’s hardly a performance that isn’t spot on. Although, I should say, there was one actor, who obviously wasn’t very experienced, as he was playing a kid, and obviously was a real kid! But this is an aberration, normally, the child characters are played by female adult actors (as is done on The Simpsons). My favorite returning villain for Season 3 was the Mad Monkey (voiced by Christopher Mott). But this time he’s returned with his own assistant, but just like RP, he can’t seem to wrap his mind around an aggressive female sidekick. New characters like The Red Squirrel (played by Denise Anderson) also charm – I do hope to hear more of her! One thing I’d been missing from the show by listening to the podiobooks collections in the past, was the wonderful commercials. Every episode in the regular Decoder Ring feed has some sort of commercial endorsement. This could be from a website or a company, but often they are just the cutest little skits paid for by family members wishing each other a ‘happy birthday’, or ‘happy anniversary.’ How cool is that? In the final episode of Season 3, old villains like Professor Von Schlitz are aligning themselves with new enemies like the Third Reich (!) but that isn’t the half of it. See, on the personal front, the blossoming romance between Panda and Squirrel is brought to the fore in the last epsiode. I imagine every longtime listener to the show who’s heard it is just freaked-out to the max about the final scene. Will where the show has now gone ultimately bring the end of the show? We’ll have to wait about two more months to find out. There is nothing QUITE like Canada’s Greatest Super Hero. And what better day to crow his achievements (and those of The Decoder Ring Theatre led by the indomitable Gregg Taylor) than on the holiday celebrating this country to the North. Cheers! Here’s to the next three seasons and beyond!!! Oh yeah, it’s good! I am a comic book fan (for over 35 years) and for a series in the radio drama format (kind of Green Hornet with a bit of the Shadow, with the added dynamic of male/female lead characters) – it holds up surprisingly well in comparison with some of the best of the “more sophisticated” modern superhero stories. It is intentionally for all ages, but that doesn’t make it childish. When a new episode is available, it is always my favorite podcast of the day (and this is out of well over 70 active podcasts in my podcatching queue). The Red Panda is a must listen, it packs more storytelling goodness in it’s ~ half hour episodes than most audio dramas do in longer formats! If you haven’t heard it before, go over to Decoder Ring Theatre or Podiobooks and download away, you won’t regret it. You’ll laugh, you’ll cry, and you’ll want to hide behind the sofa – many thanks to Gregg and the gang! Zowie, what a great radio program. I love it and The Squirrel (and the big guy also.) Makes me wish I was Canadian. Decoderring Theater is GREAT! I have collected hundreds of hours of old time radio programs, and Gregg Taylor’s RED PANDA and BLACK JACK JUSTICE are among my most favorite shows, even tho they’re not really “old”. The shows are so much fun that I’d expect the cast to pay Gregg for the pleasure of being in them! If you haven’t listened to these shows, you’re missing a sure bet! 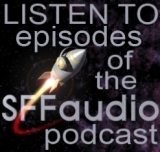 You need to listen to it all — what can I say, the best Podcast audio drama I’ve heard in years, it’s got it all — humor, production values, solid story line, etc. Romance, voice talents.